I suppose I should apologize for the long wait for details of my Heartbreaking Romantic Affairs. I’m not going to, of course- you all already knew that punchline. Instead, I’m going to tell you about what I’ve been doing lately, then I’m going to address that pesky pencil- who now calls itself “Le Crayon”, believe it or not. I’m not a complicated kind of man, hm? I call a Faberge egg a Faberge egg. There’s no pretentions about it, hm? It’s plain, unadorned, and simple. It is not hard to understand. I don’t understand people who pretend to be something else- it’s a bore. You know, I’m over this whole “relationship” business anyway- I don’t need a pencil. I can just project drawings onto the paper. I simply have to look at the paper, and beautifully drawn lines will appear on the paper. Then I glare at the paper some more and the lines are filled in and everybody says “brava!” when I show them the sketches at dinner that night. I find this to be a much more elegant solution- the pencil thing was a mere formality, something I did for the cameras, really. It is like the queen wearing her crown, or Hitler carrying a gun. Darth Vader using a light saber. Madonna using her voice during concert (everybody knows that Madonna can just think what she wants to sing, and it comes out of the speakers.) But we are in a new era, here- we are in the two thousand and tens. From now on, I shall merely glare. The oppressive pencil-owner relationship is a thing of the past. Really, readers- how many times have you heard someone say “I love it when my pencil gives me cuddles”, or “I want to live with my pencil”. It sickens me. It makes me want to pull out the collars that I’ve swallowed over the years from my throat and toss them at the homeless people on the street- the disgusting homeless people- and then proceed to the parks where people clasp their pencils in their hands and throw my Faberge eggs at them (well, that’s how Russian royalty does an egging). From now on I am not even a one-pencil-man. I abstain. I am a one-man man. I date Karl Lagerfeld, and only Karl Lagerfeld. Even my mirror image is not authentic enough- sure, he’s as good looking as I am, but does he have the quick wit? And I am currently auditioning my shadow on being part of myself. I am very, very serious about this one-man man business, you see. If my shadow is not good enough, I will chop it off with a pair of scissors from the atelier. In any case- here is the letter from the so-called “Le Crayon”. I screw my nose up to it. In fact, I screw my nose up to all this “couples” nonsense. Pencils and their owners disgust me. Rei Kawakubo does not have a pencil. Nor do I. My thoughts of our Oompa Loompa massacres brought a tear to my metallic embellishments. you know this is not personal. You have always been the one pushing me to the side of your pocket, away from your heart. Do you remember when you snapped three pencils in front of me, to show me what would happen if I didn't perform? Do you remember the week I spent in the bottom of a Vuitton bag in punishment for a less than perfect collection? You threatened to leave me after you lost all your weight. You told me you were now fit enough to carry around a million of me, that you didn't need me anymore. I put up with a lot from you, K. I stuck with you through fat and thin - it... it almost hurts that you wish me to be ground down to a stub. It was you who left me at the Four Seasons after cola with Anna. I waited for hours for you. Then, Vivienne found me. I was a mess, I tell you. I had rolled under a table and I was covered with dust and stray hairs. I was almost down the drain before I caught her eye. Anyway, I'm over that now. Vivienne, she just cares for me. She wraps me in her hair when she's not using me. I can get lost in there for hours. She chews on me when she's thinking - she even writes letters with me, letters. When was the last time you wrote a letter, K? It is early here, I can hear Vivienne calling. She must have woken up. My Faber-Castell pencil, Gramercy Park, New York. Photo Karl Lagerfeld. Look, Karl, I know you have your minions out looking for me, but I am a pencil in Paris who doesn't want to be found. I am in the hands of someone else now. You were always too generous with lending me - now I am gone. What can I say? P, you know that's not where you belong- My clothes are never dirty and my hands are always clean, aside from the blood of countless Oompa Loompas. Don't you remember the good times we had? We went to the beach where I took photographs of Claudia- we spent many nights in bed, sketching couture- do you remember our outing to Vermont? Don't let Anna fool you for a second- you're my number one, aside from myself. Frankly, I am not going to search for you anymore. I am calling the hounds off. There are a lot more pencils in the jar. Your new owner could grind you down to a mere point with one of those new mechanical pencil-shavers. How would you like that? Could you wear Philip Treacy if you were a stub? Could you dress in fur and ivory from pianos? Think about that, young pencil. I have to tell you that I have been in a lot of pain lately. I have lost my favourite pencil, again. 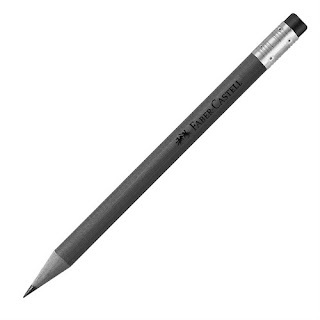 Many of you may recall that I lost my favourite pencil a year or two ago, and the chaos that ensured around Paris while I searched for said pencil. I looked for my pencil, and the silence told me it was not there. I asked it to come back two times and there was silence for two times. As you know if you follow Karl Lagerfeld's Guide To Life, I try to promote an alternative lifestyle (that I used to call in French La Lagerfeld Diet), based on sensible tenets such as repetitive wearing of collars. My pencil's decision to disappear will be clearly be seen by conservative, pen-wielding types as a lead-based revenge against the sketches my pencil and I used to share. Right now- well- I can't even pretend to be a mess. I'm quite perfect. But, it is still distressing. I have hundreds of agents on the lookout for it, throughout Paris, right now. Perhaps I will go and take pictures of naked young men- that always cheers me up. Brad? No- wait- what's your name? You know, the new one. Italian, I think. (Note to self: name all young male models the same name, as Yves did with bulldogs. Hard to remember names. Call them all concubine or something similar).